The View From Here | Panoptika = seeing everything. Because your context is critical. We’ve been using the Innovation Games® framework Speedboat for many years to help teams evaluate the anchors holding back their product or company, then develop solutions to cut the anchor chain and propel them forward. It’s a great, easy to understand metaphor. We adapted it to use the Sailboat analogy so we could add in the positive aspects of the breezes filling the sails, representing the things which are moving the team or product in moving. This went down especially well in coastal areas. Recently we’ve been extending the metaphor to more closely align with the elements of SWOT analysis (Strengths, Weaknesses, Opportunities, Threats) that most managers are used to using. Our approach using anchors and wind, didn’t differentiate between internal and external factors, so anchors could capture both Threats and Weaknesses, and winds could capture Opportunities and Strengths. As this seems like a brilliant idea, it must have been done before, right. Well…it has. There are two approaches we like, developed by diverse organizations; Black Swan Farming and Paladin Studios. So you can see the original elements, but they differentiate Storms, or negative wind events, representing Threats and Anchors, which represent Weaknesses or internal barriers. The Tradewinds are a positive wind, so represent Opportunities, and the sails are the Strengths, as you can set the proper sails for you market, increasing or decreasing as required. In this case they extend the metaphor in, perhaps, an even more appropriate way. As Threats and Opportunities are meant to focus on external elements, they use an Island to represent Opportunities and a Reef to represent Threats. Their use of the sailboat with it sails representing Strengths and Anchors representing Weaknesses is consistent with the original Innovation Games® Speedboat game, as modified. So we encourage you to think about how you might use these tools to help move your product, service, team or organization forward. As always, you can benefit from having a professional facilitator help you with game design and set-up, playing the game, and then post-processing the results. We’re always willing to help. Learn to fail. Fail often. Fai l fast. Does this sound familiar? Failure is the current focus in many schools of “entrepreneurial thinking”. We contend that it is of no consequence whether you failed – rather, it’s what you learned that’s important. For us, “You win or you learn” is the key to keeping going when things don’t turn out quite as we had anticipated. Seeking the “why” of any outcome will build your understanding of the processes, paradigms, or procedures that got you there. That kind of insight will improve your future outcomes, regardless of whether you won – or learned. Megann has been re-reading Peter Drucker’s classic, Innovation and Entrepreneurship. It’s interesting to see the predictions (hmm…in the 80’s, innovation and entrepreneurship were the future that would save the economy – sound familiar?) What Drucker stressed was that innovation and entrepreneurship were not just about new technology, but about a revolution in thinking, in doing, and in performing. In short, innovative would be demanded of every organization. 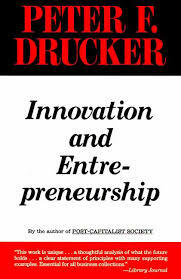 Fast-forward to today, and Drucker’s work really does look like a seminal work – with many of the same messages in “new” (dare we say “innovative”) treatises on innovation and entrepreneurship theory. So it seems worthwhile to revisit Drucker’s Seven Opportunities for Innovation. (For more inspiration, check out the Drucker Institute). We help our clients explore opportunities to find out which are right for them and their organization. Which one resonates with you? All of these opportunities are still valid. If you need a hand exploring them in your business, we’re ready. Where should your product or service go next? What will the next iteration look like? Product managers wrestle with these questions all the time. Sometimes they talk to their colleagues or others within the organization. Perhaps they listen to feedback from channel partners. And if they’re customer-centric, they’re finding ways to listen, observe, and discuss the customer journey. Often these explorations occur separately from one another. It doesn’t have to be that way. As soon as we disconnect a desired new feature set from real things like production limitations, distribution challenges, or plain old price, we’re only considering part of the story. Taking this approach can mean that you as a product manager are setting each of these groups of stakeholders in opposition, weighing the needs of one against another. Invariably this sets a big weight on your shoulders. We contend that it’s a weight that doesn’t need to be there. Collaboration is the lucky four-leaf clover that can provide everyone with a solution they can live with – without watering down the final result in some sort of “management by committee” scenario. While this used to involve a lot of expensive, time consuming travel and research, modern collaboration tools and techniques mean it’s much easier to get all these people around the table. Having a chance to explain their rationale, answer the big “why” questions, and see their feedback having an impact during the planning process is much more effective that having to explain why they didn’t get what they want. Moreover, it could even result in an even better approach than any one group had thought of alone. Imagine investing a little talk time up front to come up with a product that’s truly wanted, efficient to produce, and easier to deliver. If that sounds like the sort of lucky outcome you’ve been looking for, we have the tools that can help. Marketing research has its place – analyzing customer data and looking at behaviour can help us see all sorts of valuable and useful patterns. Bringing customers together in a room can add a layer of rich understanding that isn’t as tangible for you and your colleagues when looking at the data, no matter how skilled the analyst or interpreter. What we like about bringing clients and their customers into a room together, is the shared understanding that develops. Moreover, customers or users develop a new level of trust when they can sit at the table with your team and express their experiences with your company or your products. They know their ideas and feedback aren’t going into some deep-dark data cave. Another observation about using games to solve problems, find answers, make plans, or explore opportunities, is that your team is more likely to believe what they hear, when they hear it in person. The ability to finesse an explanation means that there are fewer ambiguities and more empathy. If you’d like to build trust in your customer relationships, we highly recommend involving them in co-creating your future. We’d like to help. Our developers want too many added features but I don’t know which one our customers will value the most – how can I get them to prioritize? What’s holding my sales team back, and how can we fix that? We have trouble knowing what impact our product has on our customers’ everyday lives. How can we capture that? Stay tuned next week, when we’ll be live-tweeting from the Conteneo Collaboration Confab. And if you’re interested in enterprise collaboration or civic engagement, join us! A lot can happen in a year, and while we’re all for a certain amount of nostalgia, spending too much time looking back can hinder our ability to move forward. Still, a little stock-taking is worth it, before moving on. Look at that deck. That’s where we were around this time last year. Buried. We were surrounded by beautiful countryside but frankly, the environment was better suited to retirement than the active life we really want. In 12 months, we made a decision to relocate our business, sold a house, bought a condo, and moved halfway across the country. Now, high about ground level, the chances of us having snow up over our windows is pretty remote. How did we figure out that this was the right move? And moreover, how did we figure out how to get here? We used the same tools we would have used with clients facing the same sort of life and business challenges. From goal-setting to action plans, we thought very carefully about where we wanted to go. Step one was to establish the future state, or as we sometimes say, “where we wanted to be when we grew up.” Lists and discussions – how do we like to live? What kind of work do we need to do? Where are the clients? What’s our purpose? Having established a picture that included those things, we needed to figure out how to get there. One tool that helped here was to look backwards…sort of. We played a game called “Remember the Future.” Our friend Luke Hohmann came up with it – seeing yourself, your product, or your company in a future state and then working backwards to determine the milestones that will get you there. His company, Conteneo, has a host of great tools that facilitators like us, use to help people and companies navigate the sometimes winding and branching paths to where they need to be. Before we knew it, we had a roadmap of key tasks that needed to happen. Sell the house. Find a new space. Organize the move. Fit it all around our current commitments. And we did it. Step two: just get started. Put one foot in front of the other and start moving toward the milestones. Some took longer, some were easy, some were a challenge. But here we are. Join us on our journey – and if you or your company need help getting where you want to go, get in touch. It would be our pleasure to help. Determine a time you want to arrive. Look back and see the steps it took to get there. Good luck, and here’s to a purpose-filled, prosperous and productive 2016.